You can believe the reasons LaToya Cantrell, Doug Thornton and Kevin Dolliole gave in their press release today for delaying the new airport’s opening, which was supposed to happen on May 15, or you can use your powers of deduction. Remember the part in bold, as we’ll get to it in a minute. It gives this whole game away. Now it’ll be $1.2 billion, or more. And this delay comes after we’ve been assured that all was well for a May 15 open – ever since the opening was pushed back from September of 2018 thanks to the discovery of a sagging sewer line that made all the bathrooms inoperable. This is the fourth delay in the airport’s opening; one wonders why it is that they never seem to be able to meet a schedule. Especially when the airport people have been bubbly in their attempts to show off how nice it is and boy-is-it-gonna-be-great-when-it-opens. And now they need six more months? “Airport officials believe this will also give local residents time to become accustomed to the new access routes.” Want us to translate that for you? Here’s the translation, and it doesn’t take a genius to figure this out. What’s going to happen this fall? The gubernatorial election. The primary is in October and the runoff is in early November. As for the “new access routes,” there basically are none. Which is something we talked about here at The Hayride back in March. There are no flyover ramps from I-10 or I-310 leading into the airport – you’re going to have to get off at the Loyola Drive exit, and sit at a stoplight, then catch another stoplight at Loyola and Veterans, and then you’ll be able to take a four-lane road (which isn’t completed yet) into the airport’s access road. Those two stoplights will back traffic up onto I-10 and cause daily traffic jams on the interstate far beyond the Loyola exit. Traffic backups from, say, the Clearview exit well into St. Charles Parish over the Bonnet Carre Spillway will be common. And for people using that airport from parts west – the River Parishes, Baton Rouge, Hammond and beyond – you’ll no longer be able to take the 310 exit to Airline Highway and access the airport from there. 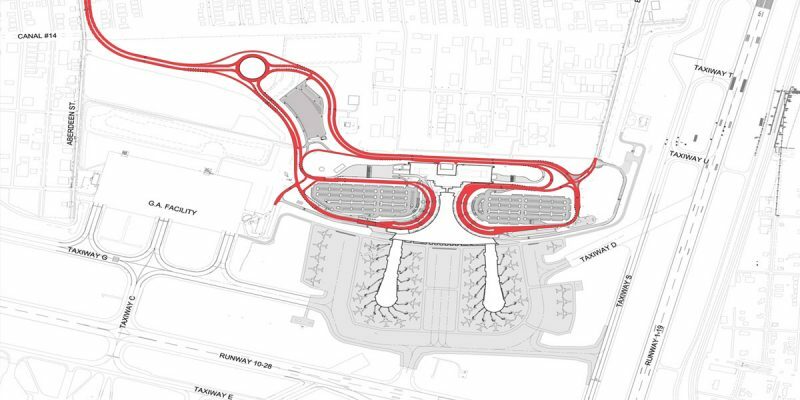 That’s where long-term parking will be, and you’ll essentially be parking your car there and then taking a bus that will go all the way around the airport property to the new terminal, adding 20 minutes to your trip. Nobody knows this as yet, and when you tell it to people they don’t believe it. Seriously. Try it, and see the looks of horror and disbelief you get. So this is pretty obviously a political move. It’s pretty obviously an effort to kick this can to the other side of the election cycle, and therefore escape the fallout for the complete disaster traffic will be from the time this airport opens to 2022, we think, when the flyover ramps to access it are built. Because those flyover ramps are the responsibility of the Louisiana Department of Transportation and Development, which is the responsibility of the governor. And if the traffic jams inevitably resulting from this mess were to have begun on May 15, or any other time prior to the election, you can believe the TV and radio commercials, and billboards and web ads, proclaiming “This traffic jam brought to you by John Bel Edwards” would have been overwhelming. Plus, don’t forget that in Jefferson Parish, which is going to be the epicenter of this disaster whenever the new airport does open, John Bel Edwards actually managed to beat David Vitter with 51 percent of the vote in the November 2015 runoff. Think those soft Jefferson Republicans who voted with Edwards because then-sheriff Newell Normand told them to will re-up that vote when they’re stuck in traffic half the day thanks to the new airport? Think again. By punting this thing to “fall 2019,” which means “the Monday after the runoff,” Cantrell and her crew are essentially eating a bullet for Edwards – they’re taking the heat now for not having it built on time as opposed to Edwards getting annihilated for wasting three years before building roads into the airport. And the really interesting question becomes what promises John Bel Edwards made to the New Orleans airport people in exchange for their saving his bacon – and how much of your tax dollars will be siphoned off to pay for those promises. But for now, you should just be happy that your driving experience into and out of New Orleans won’t be destroyed starting next month. Instead it’ll happen in time for Thanksgiving, Christmas and Mardi Gras – but by then it’ll be years before you can express your disapproval at the ballot box.